Cookbook #14: Weight Watchers 365-Day Menu Cookbook. Weight Watchers International, Inc., New American Library Books, 1981. This is one of the many diet cookbooks that I purchased over the years. Diets, a fitting topic to cover for a January post, eh? I’ve never taken part in a Weight Watchers program, but I believe that they encourage a good, balanced eating program. So, over the years I picked up a couple of their cookbooks, to get ideas for recipes. About half of this particular cookbook is taken up by meal plans. As the title indicates, it plans your meals for 365 days – an entire year. I scanned through these menus and they left me uninspired. 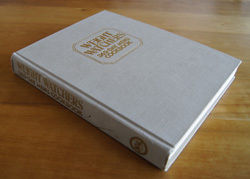 Then I scanned the rest of the book, which contains recipes for the dishes in the menus. Again, I was uninspired. Some ingredients are just weird. Like, they call for you to boil skinned chicken necks and backs, to make a dish that is “filling and easy on the budget”. No no no, I’d never do that. Another recipe directs you to whip evaporated skim milk for 15 minutes to make a low-fat dessert. 15 minutes! Maybe that will help burn off calories. But no thank you, if I want a light, calorie-controlled dessert, I’ll buy one of the convenient frozen diet-type desserts that are available today. One recipe calls for “1/3 cup plus 2 teaspoons orange juice”. Now that simply doesn’t make sense. The same recipe calls for “18 ounces vanilla flavored dietary frozen dessert”. I don’t even know where to find that. A salad dressing recipe has a few seasonings added to “1 tablespoon plus 1 teaspoon olive oil and 1 tablespoon white wine vinegar” and serves 4 people for 42 calories a serving; again, exact measuring is called for and each person gets only 1/2 tablespoon of dressing on their salad. Another recipe calls for artificial sweetener and 1/2 teaspoon curacoa extract (what’s that?). The recipes are a bit nutty on calorie content. For instance, in the recipe I chose (below), it states to use chicken breasts that are “about” 8 ounces each, and gives the calorie content as “193”. Why such a specific calorie value for an estimated ingredient? 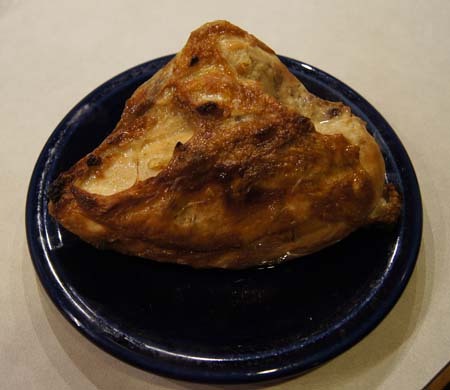 Today we are so fortunate to websites like Nutrient Facts, where I can quickly look up “chicken breast, meat only, cooked, roasted” to learn that 4 ounces of roasted chicken breast has 180 calories. This is a cookbook that I will recycle. I found a recipe to try in this book, but only one. This cookbook might work for someone who has no imagination and likes to follow recipes obsessively and likes to think that they know exactly how many calories they are taking in. But that person is not me. 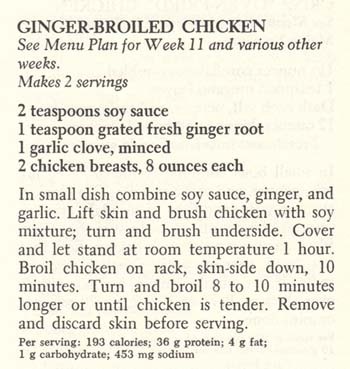 The recipe I chose to try is “Ginger-Broiled Chicken”. I like this simple recipe because it uses freshly grated ginger in a garlic-soy sauce mixture that rubbed under the skin of chicken breasts. The chicken breasts rest at room temperature for an hour before broiling. (This is unusual, most recipes today direct you to re-refrigerate chicken marinades as soon as possible.) I think the chicken will cook more evenly if it starts the oven broil at room temperature rather than cold. Finally, only after the chicken is cooked is the skin removed. Thus the chicken should stay moist during cooking, and you can remove the higher calorie skin before eating to reduce calories. This might be a good recipe for my repertoire of chicken recipes (currently, there are almost 50 pages of recipes in my personal chicken recipe document!). Combine the soy sauce, ginger, and garlic and rub this mixture under the skin and all around each chicken breast. Let stand 1 hour at room temperature. Set your oven’s broiler to a “low” setting and preheat a few minutes. Place the chicken skin side down on a rack in a pan, then put the pan in the oven about 5 inches from the broiler. Close the oven door. Broil the chicken 10 minutes on the first side. Turn the chicken pieces, then broil another 8-10 minutes. If your chicken pieces are larger than 8 ounces each, it might take another 5 minutes to finish them. They are done when they are nicely browned and about 160˚ when checked with an instant-read thermometer. These actually turned out great! The chicken breasts that I purchased were more like 14 ounces each, so I grated a bit more ginger and minced more garlic and soy sauce. The original recipe states only “broil chicken” with no oven settings or specifics such as how far to have the chicken from the broiler. My electric oven has two broiler settings, high and low, and I chose the low setting. I took a tape measure to measure the distance that I placed them from the broiler. It worked, so I incorporated these instructions in my version of the recipe (above). It’s lovely and browned, right? I served them with the golden skin still on. The original recipe is dour and directs you to take the skin off. Why not let the diners at least enjoy the look of the browned chicken? I took the skin off before eating it, but I say, let each diner make their own decision. This chicken was moist, tender, wonderfully flavored with ginger and garlic and lightly salted from the soy sauce. I’d make Ginger-Broiled Chicken again!